"Haunting debut feature…mesmerising performance by Shahab Hosseini..
conviction and clarity of vision..
in Asghar Farhadi’s Oscar winning The Salesman). Gholam is the debut feature from award-winning Iranian artist and filmmaker Mitra Tabrizian, in collaboration with Cyrus Massoudi. The film brings together two of the most prominent Iranian actors from before and after the 1979 revolution, Behrouz Behnejad and Shahab Hosseini, the recipient of the grand jury prize for Best Actor at Cannes, 2016 for his lead role in Asghar Farhadi’s Oscar winning The Salesman. Gholam is the story of one man’s search for a sense of purpose in the alien environment – a man with no expectations who has been through a revolution, a war and a change of landscape. 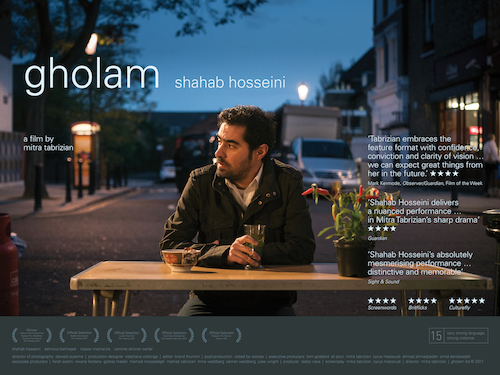 Set in London in 2011, Gholam is the story of an enigmatic Iranian cab driver, who works at night and doesn’t like to talk about his past. He has two jobs, yet seems not to be interested in the money. He eats at his uncle’s café every day, yet is fully aware of being betrayed by him. He agrees to the arrangement his mother makes for his return home, yet has no intention of going back. We learn that he was once a war hero, and yet disappeared from the battlefield without a trace. A man with no past, no future, no convictions, he still gets involved in the conflict of a total stranger and carries it through to the very end. The film brings together two of the most prominent Iranian actors from before and after the 1979 revolution, Behrouz Behnejad and Shahab Hosseini. Inspired by a real character, an enigmatic Iranian exile featured in Mitra’s 2006 award winning photographic series Border, on Iranians in exile, Gholam is the story of one man’s search for a sense of purpose in the alien environment – a man with no expectations who has been through a revolution, a war and a change of landscape.